Multiple Filament Winder | ADVANCED TECHNOLOGY | MURATEC, MURATA MACHINERY, LTD.
A filament winder is a device that automatically molds CFRP (Carbon Fiber Reinforced Plastics) and GFRP (Glass Fiber Reinforced Plastics) by winding carbon fiber or glass fiber. Filament winders are experiencing strong growth in demand as a manufacturing device for high-pressure vessels, including hydrogen tanks for Fuel-Cell Vehicles (FCV), and other molded bodies that are required to be both lightweight and strong. Our filament winder’s greatest feature is our multiple yarn system, which has considerably improved productivity, allows for a high degree of freedom in design, and enables the production of molded bodies with excellent durability, as opposed to the conventional single yarn system. 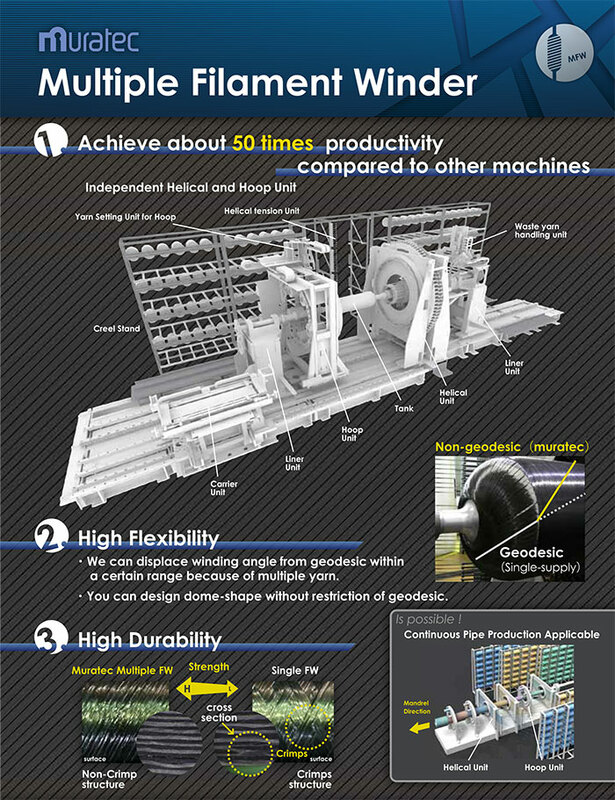 This multiple yarn system was developed by improving our braiding technology through the application of a traditional braiding technique from Kyoto in which braiding is performed while crossing multiple yarns into a string. Our multiple filament winders are able to cater to our customers’ needs across a wide range of fields, including aerospace, automotive, and medical industries.